We spent the morning in Havana, which gave us a chance to see the Museum of the Revolution. It was really interesting, but unfortunately for Dave a lot of it was in Spanish. Sufficient parts were in English though, so I think he got the gist. After a week of listening to our tour guide talking about bits of history, our trip through the museum, although rushed, really helped me to understand where everything fit in the timeline. It started at or about the Batista era, which I think I explained last time. He was a US-backed dictator who seems to have had a brutal time in power, with many people dying under his rule. It progressed through the last 50 years of Castro’s reign, from before the revolution to afterwards and how well things have progressed under him. Needless to day, it was a bit biased, but quite interesting. We returned to the hotel and were picked up by our shuttle that would take us to Varadero. It was semi-private – just us and another couple, and provided door to door service for a very reasonable price. 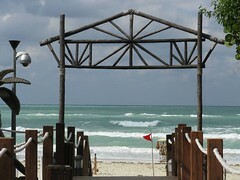 We were in Varadero by late afternoon, where we checked into the resort. There we were greeted with a glass of champagne and a cool moist towel. Not a bad way to check in to a hotel! We and out luggage were taken to our room on the back of a golf cart, along with another couple that we later nicknamed Wallace and Grommit, due to the uncanny resemblance (at least in our mind)! The room was quite nice. 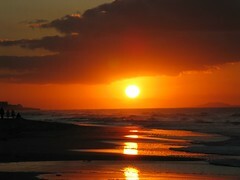 It was pretty big, with a king size bed and a porch that looked West, so we could see the sunset in the evenings. There was a bit of a sitting area, with a couch and a chair. The bathroom was pretty big too. Because we were on our honeymoon, we got an in-room bar that was re-stocked everyday and also free t-shirts that said just married (in white with lovely teal blue edging, which for some reason have still never been warn). The resort was pretty nice. We were both happy with our choice. The beach front was lovely – nice and wide and within 5 min of our room. The pool was really nice too. They were in the process of building a pool bar, which according to the staff member who showed us around, was supposed to be done the second day of our stay. At the time Dave and I both looked at it and were like ‘ya, right’. It looked close to being finished the day we left! But we didn’t really miss it. There were three pools, one main one and two smaller ones near closer to the rooms, and three hot tubs as well. 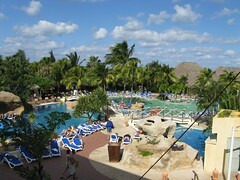 There were several bars, a main bar, a piano bar, a poolside bar and beach bar. There were also 5 restaurants, all of which were quite good. We had no complaints about the food at the resort. There were always a lot of options and quite tasty! We didn’t have any more rice and beans (not that I didn’t enjoy the rice and beans, but it did become a bit repetitive). One night, again because we were on our honeymoon, we were treated, along with all the other honeymooners, to a 4 course meal in one of the restaurants, which was really good. Unfortunately, after day 1 at the resort, the weather took a turn for the worse (which had nothing to do with the hurricane). We had two days of cool grey and very windy days, followed by some sunnier days that were still quite windy. This meant that we weren’t able to use any of the boats for water activities, like sea kayaking, paddle boating, etc. We were able to go in the ocean and play in the waves, so we did a bit of that. We also spent some time in the pool, although not much. I think I spent more time in the hot tub than either the ocean or the pool! One day we decided to take our books to the beach, but we had to build a wind barrier out of chairs to keep the wind off of us so that it would be warm enough to stay out there! Because of the weather we did a few things to occupy ourselves. One day we went for a walk along the road, passing a few other resorts. 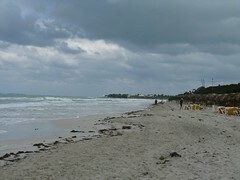 Varadero is a peninsula that basically is resort after resort. We wandered to the ecological reserve area and paid $3 for a piece of paper that guided us along a trail that was maybe 1km. But it was neat – we saw huge termite hills, some caves and a bog. We also took the double-decker bus into Varadero one day. Unfortunately, everyone else staying at Varadero had decided to do the same thing. So the bus was rather crowded with tourists and Dave and I couldn’t wait to get off! We wandered around town and another artisan market, then headed back to the resort. 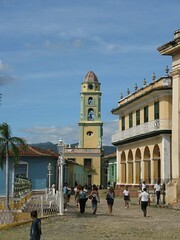 We also took a day tour to Cienfuegos and Trinidad, which are both UNESCO sanctioned towns. They are located on the South coast of the island. It took as about 5 hours to get there and 5 to get back, with a bit of time in each town. I’m pretty sure Trinidad only had tourists and no actual people, because that is all we saw! It was an interesting town, but we were never hassled so much in the entire two weeks we were in Cuba. This after our day tour guide told us that it wasn’t as bad there as in Havana. I beg to differ. Although it was an interesting tour, and the scenery was lovely, it was really quite far and I’m not sure I would do it again that way. We also went for walks along the beach, passing other resorts. We decided the Sandals definitely has some of the best beachfront. All in all we enjoyed it. Most of all it was great to just relax for a whole week and not have to worry about anything aside from where to eat and what to do between meals. Dave and I both enjoyed the bike tour more, because we are both active people and enjoy seeing the actual country that we are visiting rather than a make-believe world that is pretty much cutoff from the actual country (this may be a harsh view of all-inclusives, I really don’t have much against them but at this point in my life I would rather travel I think). It was a very nice resort and we both really enjoyed the much needed downtime. The only bad part of the trip came the morning we left. I had booked a shuttle back to the Havana airport at the front desk earlier in the week, which was supposed to be included in our package. Unfortunately, somehow it turned out that it wasn’t. So after 10 min of waiting for the shuttle, and about 15 min of trying to work out with the front desk why we were still waiting, we had to take a private taxi back to Havana, which cost a pretty penny (let’s just say about 4 times what the shuttle had cost to get there in the first place). We made it to the airport exactly 2 hours before our flight, which was a relief. We are now trying to sort out with the travel agent what happened and trying to get our money back. Unfortunately in the rush and confusion of getting to the airport and paying the taxi and trying to figure out where to go, we forgot to get a receipt. So I’m not sure how well our attempt to get our money back will be. That’s about wraps up the honeymoon trip to Cuba! I definitely want to go back, in about 10-15 years, to see how the country will have changed. Everyone there has high hopes for Obama, if not to lift the embargo, at least to open up the travel restrictions. Whether that is actually good or not, I am not sure. It was quite nice to go somewhere with no Americans! The tourism industry is booming. I was surprised to see so many groups, but also so many individual travelers. I would definitely recommend Cuba as a travel destination, and don’t just stay at your resort!